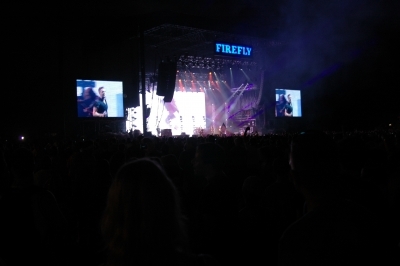 Saturday, Day 2, at the Firefly Music Festival in Dover, DE, ended with a bang from the pyrotechnics of mainstage headliners The Killers, but there was plenty of action through out the earlier part of the day. The weather was again very cool and cloudy, with a few sprinkles throughout the day. It was very comfortable for a festival held in the middle of a mid-Atlantic summer. It feels like early April. The sun will indeed come out tomorrow, but still only reach about 80. The British isles type weather didn't stop Graffiti6's Jamie Scott, Spearhead's Michael Franti, and Grouplove from organizing a little game of soccer back stage late in the afternoon. Here's a rundown of some highlights from today's performances. 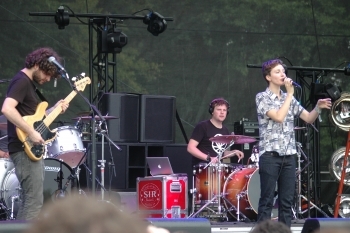 Polica took the Lawn stage early in the afternoon and poured out an excellent set. They have burst onto the scene with their minor chord laden electronic soundscapes, powerful basslines, complex percussion, and soothing vocals. Their debut record came out in February. 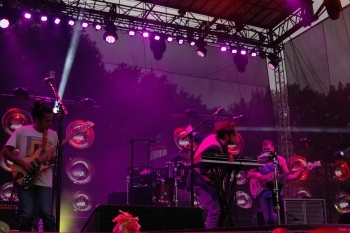 Michael Franti and Spearhead had the crowd moving and grooving, swaying and jumping despite the drizzle. It's hard not to be happy with his unique style of reggae and rock. 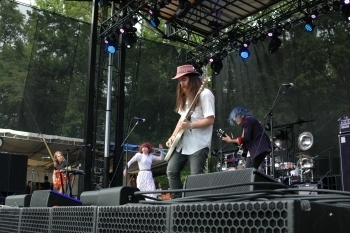 Grouplove's high stage energy during their performance drifted into the crowd gathered in front of the Lawn Stage. They were definitely having fun being at the festival. 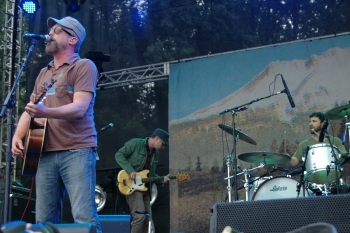 Cake was incredible, showing they are one of the true veterans of the weekend's lineup. Every song they played was either a huge alternative hit or a crowd favorite like “Sheep Go To Heaven” and “Rock and Roll Lifestyle”. 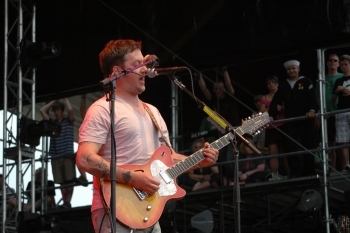 Modest Mouse showed their musical dexterity and diversity by showcasing their different sounds and instrumentation. They've had a long journey from indie roots to big name recognition, but can rock a festival with "Float On" and "Dashboard". Passion Pit was on the lineup, and I was looking forward to catching them live especially since their new album Gossimer just came out this week. Unfortunately due to lead singer Michael Angelakos' decision to seek treatment for his bi-polar disorder, they cancelled the rest of their tour just this past week. I wish Michael the best. 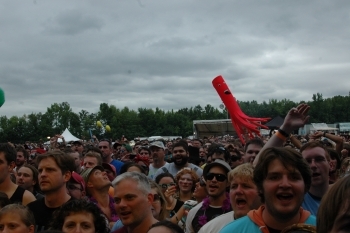 However, the incredible folks at Firefly were able to find an equally incredible replacement. 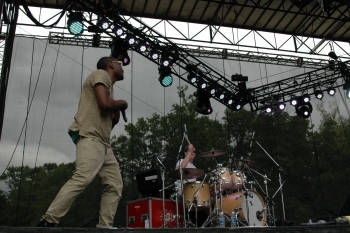 Yeasayer graciously filled the spot last minute and tore the up the Lawn stage. 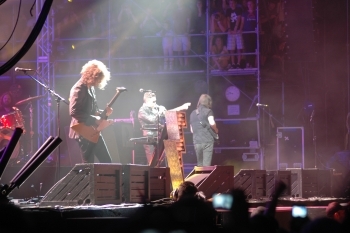 The Killers were the main attraction for many concert goers today. It's hard to blame them. 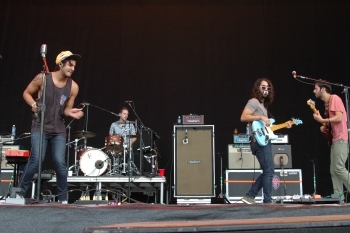 This is only the third show the band has played since November 2011, the other two were just in the past 2 days, and before that only a spattering of dates going back to 2009. Next they play a show in NYC then off to Europe and Australia until 2013. The guys from Las Vegas didn't show any rust though, putting on a full on rock show with a huge video wall behind them, pyrotechnics, and capricious confetti blast. Brandon Flowers sounded very good as they played hits like "Somebody Told Me", "Mr. Brightside", "All These Things That I Have Done" including the new single "Runaways". Tomorrow is one more day in The Woodlands and the lineup just keeps great bands coming. Cold War Kids, Fitz and the Tantrums, Death Cab for Cutie, Flaming Lips and AWOLNation are a few. It all wraps up with The Black Keys on the main stage Sunday night. Keep checking facebook and twitter for updates, and listening to iradiophilly.